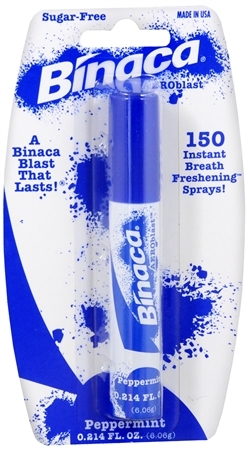 Uses A Binaca Blast That Lasts! Great tasting flavor leaves your mouth feeling cool and refreshed. Long lasting. Sugar free. Convenient size for pocket or purse. Approximately 150 measured sprays. Warnings EYE IRRITANT. In case of eye contact, flush with a generous amount of water for 15 minutes. If irritation persists, call a doctor. Contents under pressure. Do not puncture, incinerate, or store above 120 degrees F. Keep out of reach of children.